Enjoy a 90-minute cruise in Boston Harbor which heads out to Fort Independence located on Castled Island and named after George Washington. Then circles back to the inner harbor to see the Mystic Tobin Bridge, Leonard Zakim Bridge, Custom House Tower, Old North church steeple, USS Cassin Young, and the USS Constitution. An extra special feature on this cruise is the cannon fire at Sunset, which is presented off the USS Constitution every night to announce the setting of the sun. Please Note: Beginning on November 15, 2018 and moving forward this event will be 2 hours. Plan to arrive 15 minutes prior to the scheduled meeting time to check-in at the ticket booth, obtain boarding passes and pre-board. Join us for an after work cruise to relax with friends and watch the sky as it changes from blues to oranges behind the outline of Boston's city skyline. Experience a sunset cruise departing from the bustling Rowes Wharf and head out to watch the sun go down over the city of Boston. 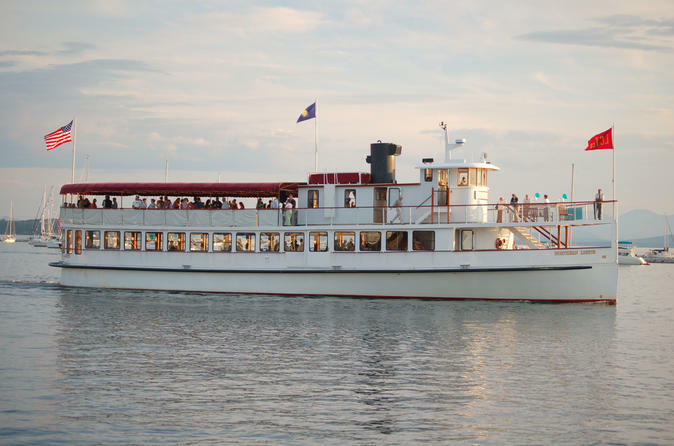 Bring a date or meet a group of friends aboard the classically styled yacht, Northern Lights. Our captain will provide light commentary of Boston Harbors sightseeing highlights. Otherwise light music will be played throughout the trip. Cruise by the U.S.S. Constitution at dry dock in the Charlestown Navy Yard. Here our cruise will wait for cannon fire, presented by the US Navy to announce the setting of the sun. The Northern Lights, a 1920s inspired New England Commuter Yacht, offers bench seating in the open air on our top deck as well as a climate controlled interior cabin. Adult beverages, soda, water, and snacks are available for purchase. Please Note: Beginning on November 15, 2018 and moving forward this event will be 2 hours. Plan to arrive 15 minutes prior to the scheduled meeting time to check-in at the ticket booth, obtain boarding passes and pre-board.